BMW of Denver Downtown is bringing you the Sonic Price. That means fair and upfront pricing on our entire inventory, plus no hidden dealer fees. In fact, we have No Dealer Handling Fees - Ever. Discover the Sonic Price today at BMW of Denver Downtown! Dealer fees are how the dealership makes extra profit. These added costs are not listed on the sticker price, and can run upwards of $500 or more! 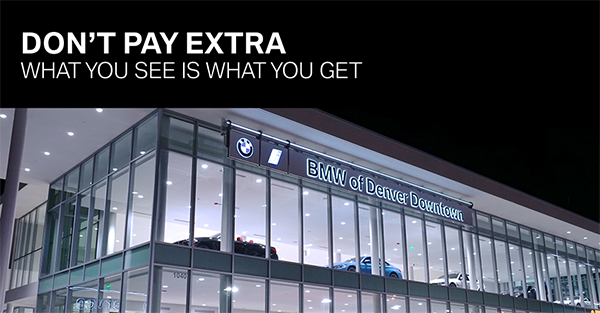 We want you to have a better car buying experience at BMW of Denver Downtown, which is why we decided to forgo dealer handling fees. The price on the sticker is the price you pay. No tricks, no hidden costs. Just transparency and the best value for you. Come see all the quality BMWs at fair market value and, best of all, with No Dealer Handling Fees. Find your next BMW today at BMW of Denver Downtown!